The Voyager is the board for people who want to go places. It's dimensions make it suitable for larger paddles or people who want to carry extra loads. With it's extra depth and RSS batons the Voyager's stiffness is boosted which helps it cut through the chop. Underneath is a large removable centre fin with fixed tail and nose runners to aid tracking especially in windy conditions. 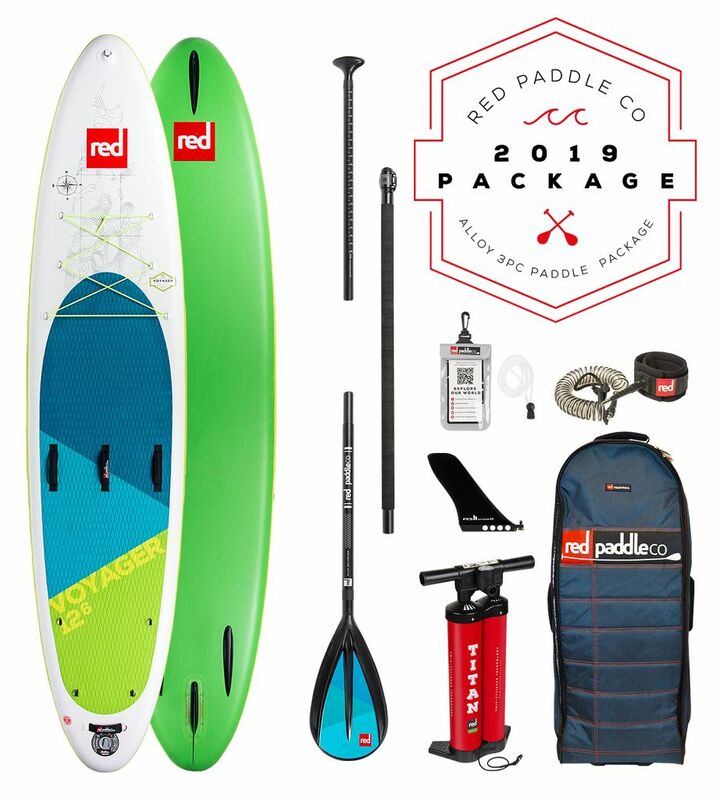 Other features include tie down bungees, bombproof fixed fins and a RED imposed deck pad. Included in the package is a twin cylinder Titan pump, transit bag, full weight leash and paddle of your choice. Carbon 100 - This performance paddle uses a carbon weave for greater strength whilst keeping the paddle super light and responsive. Carbon 50 - The curve of this paddle’s carbon hybrid blade is performance-enhancing, and the shaft has a dynamic flex that will put extra spring and energy into your stroke. Carbon Nylon - If you’re looking for similar performance to the Carbon 50 paddle but greater durability, this is the paddle for you. It has the same lightweight shaft but with the added durability of a nylon blade making it perfect for sharing amongst friends and family. Alloy - The Alloy Nylon paddle is the entry-level paddle, but no less technical for it. The mid section of the paddle shaft is coated in soft-grip EVA adding comfort and grip without adding weight, and it has an ergonomic t-grip handle design which fits snuggly into the palm of your hand.